"The six-member team comes from six different countries, and reflects the global presence and diversity of the sports of baseball and softball," co-president Fraccari said. SAINT PETERSBURG (RUSSIA) - The World Baseball Softball Confederation (WBSC) today announces the team that will carry the Olympic dreams of baseball and softball players and fans around the world into the presentation to the IOC EB for inclusion in the 2020 Games. The multi-national team includes Maria Soto, Venezuela's greatest softball star and Australia's Justin Huber, a professional player with major league experience in the United States, Japan and Australia. 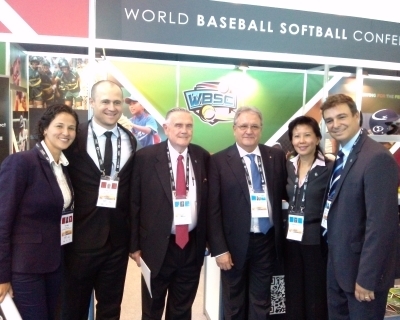 The presentation team also comprises Antonio Castro, from Cuba, Vice-President of the WBSC, the newly formed international federation combining baseball and softball; along with Beng Choo Loo, Secretary General from Malaysia, and co-presidents Riccardo Fraccari, Italy, and Don Porter from the United States. Co-president Porter said inclusion in the Olympic Games is the greatest goal for every sport and represents the pinnacle for athletes everywhere, and is an honour that must be earned. "We appreciate the opportunity to illustrate how we think baseball and softball could add value to the Olympic Movement. This is an important moment in the history and development of all the sports under consideration for the 2020 Games, and everyone at the WBSC would like to extend our best wishes to our colleagues from the other sports," Porter said. The presentation will build on the mass appeal and participation of baseball and softball to engage cities, communities and young people around the world, and highlight the values and benefits that the sports can bring in service of the Olympic Movement, including universality, gender equity, growth of participation, youth outreach, sustainability, governance, financial stability and digital marketing. "We have tried to listen and learn as much as possible from the IOC about what it takes to be included as a sport at the Olympic Games," Fraccari said.